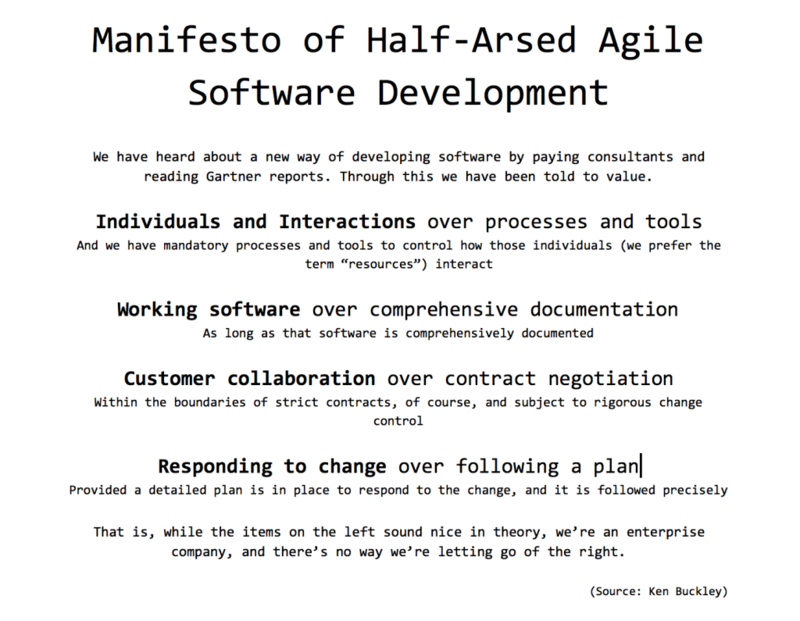 A while ago I read a parody of the Agile Manifesto at a Agile Coach Gathering. Myself and other coaches laughed about this. It is often that when agile coaches meet that we laugh about things. And sometimes we cry a little. We laugh because somethime this is the only logical thing to do. We talk about our experiences and share what we know. It is our job, or should I say our passion, to help others. That’s why we do what we do. We know something and it is know as using common sense when it come to working together within a group, team or company. We love to see people grow and excel in their work. And to see companies change into fun and creative places where people love to interact and create. We get paid, a lot sometimes, but our real payment is to see that what we know and share is used to do good. So why do we laugh? Because most of the times we see that the ideas that we promote and teach are used in a strange way. Often even in terrible ways. Our trainings are misinterpreted and even our role is misused. We laugh because sometimes it is the same as seeing your child riding a bike for the first time and ending it in the bushes or the garbage cans. A bit scary and you will never laugh in there face because you know they are trying and eventually ride that bike. We also know that one day they even borrow our car (I know, even more scary but it will happen). They are able to surpass the master. Ok, let’s turn that laugh into a smile. But sometime we cry because we see that what we do is used in the wrong way. And when we say something about it we are ignored or even expelled from the room. We see entire companies using Agile and Agile frameworks to there own liking and bidding. Roles are invented so people don’t need to change. Events are planned around the Agile events so controll won’t change. And reports and numbers are introduced around the Agile transparency so people can keep using the old ways. We as coaches try to help and say something about this but it’s the same as withthe child riding a bike. When you try to correct them they will become agitated. They want to do it themselves and that is fine. But when they keep trashing into the garbage cans or falling down, eventually they need help. But children and companies are a little bit the same. When they keep hurting and don’t see that this hurt is part of learning and growing up they start blaming that stupid bike. To bad that the comparisons end here. Because kids eventually get back on that bike because all their friends also ride bikes and they want to join the race. Companies however often change the bike. Ad side wheels and safety bumpers. Or they throw away the bike and tell everybody to just walk or better, keep crawling on all fours like they did in the past. And we cry because we see a lot of people working in companies who know how to ride that bike. So what is the big thing that is holding companies back into really changing, to really start riding that Agile bike and to have an open mind in falling down and standing up. What is holding them back in trusting us Agile coaches and throwing all the old ways overboard. To kick out that pacifier ( i love metaphors) and change? It is trust. The one small word for something big. Trust in people who want to change or just simply do the thing that they are hired for. And what is the point in hiring experts and then not listen to them. That is stupid and a waste of money and time. So what I’m trying to say is that if you really want Agile and Agile frameworks to work, start using that bike properly. Trust that the people using it will fall down but also get up again. And trust the guy or girl behind you who has that one hand on your back and the other hand on your steering wheel. Eventually the will give you that one big push and let go. That is also trust. And yes you will hear us shouting behind you not to let go and keep pedaling and to trust the bike. But the further you get, the less you will hear us.